After Prague, we were desperate for something relaxing, especially for Jonathan’s birthday week. (With approximately 17 destinations in the past six weeks, we’ve strayed seriously far from our original plan to have a couple of European bases and tempers were fraying and moods were, well, moody.) 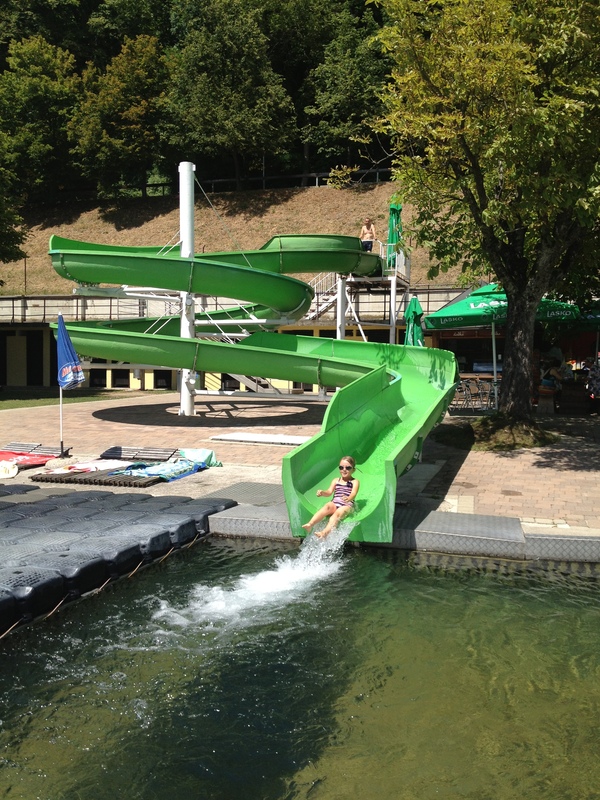 I’d heard positive reports on Slovenia generally, but still didn’t know whether it would fit the bill. 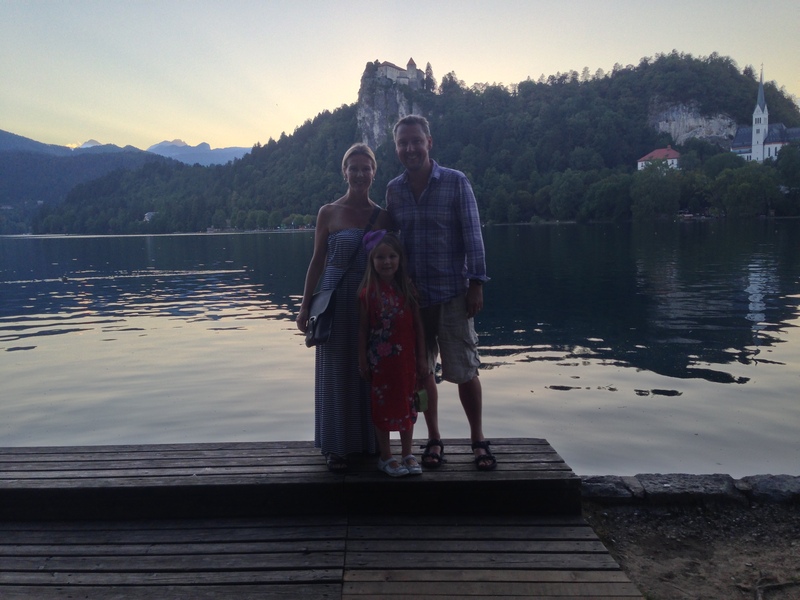 But, we needed to move on so we booked a last minute place at Lake Bled and headed south. We broke up the long drive with one night in Bratislava, which used to be part of Czechoslovakia but has stronger German roots. It’s situated on the Danube, is not as grand and exciting as Prague and retains a bit more of the Communist era feel, but it’s a welcoming place with a charming old town packed with outdoor restaurants and cafes. 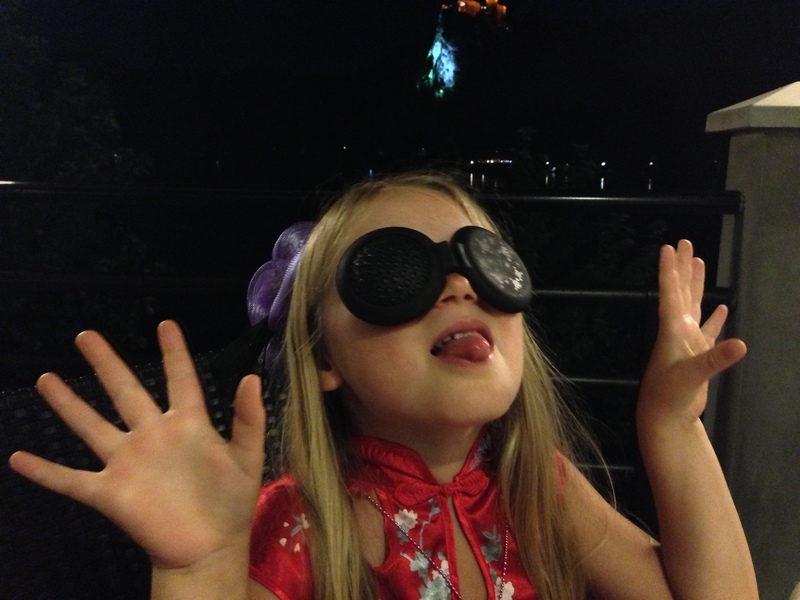 We also enjoyed a much welcome break from the price inflation we’ve felt in our other European destinations. The following morning we drove through Austria (best highway roadstops ever! 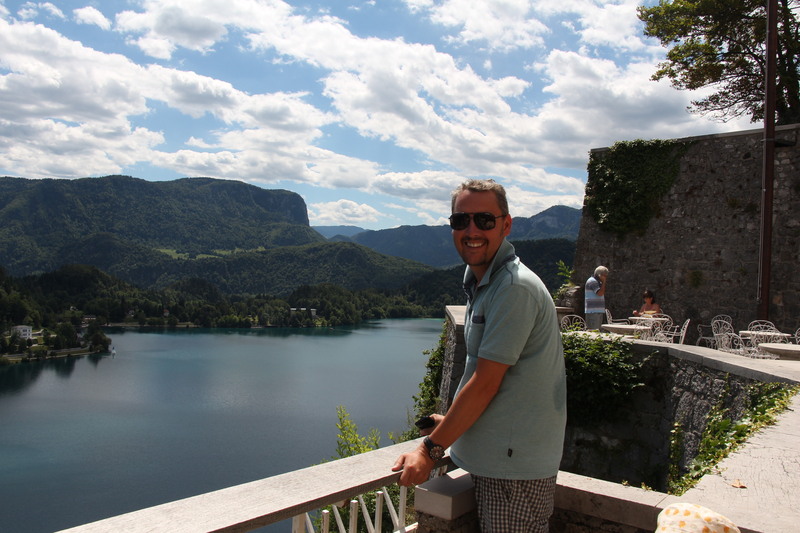 ), and crossed the border into Slovenia with a gorgeous drive over the Julian Alps down into Lake Bled. 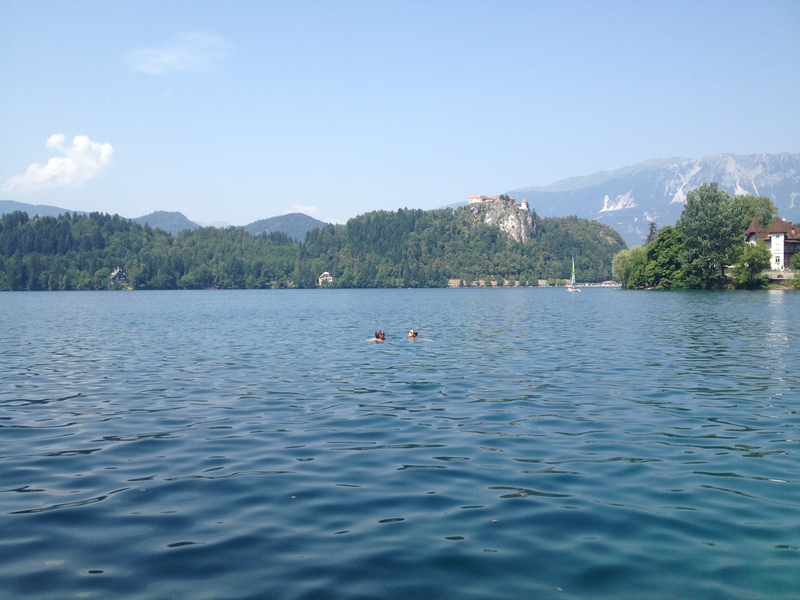 Bled was perfect. It felt like being at summer camp in a fairytale setting. The lake is small enough to easily circumnavigate on foot (under 7 km), so the setting felt cozy, yet incredibly picturesque. Lake Bled even comes with a miniature island, which houses a pilgrimage church. We never made it out there, but a set director could not design a more photographic scene. 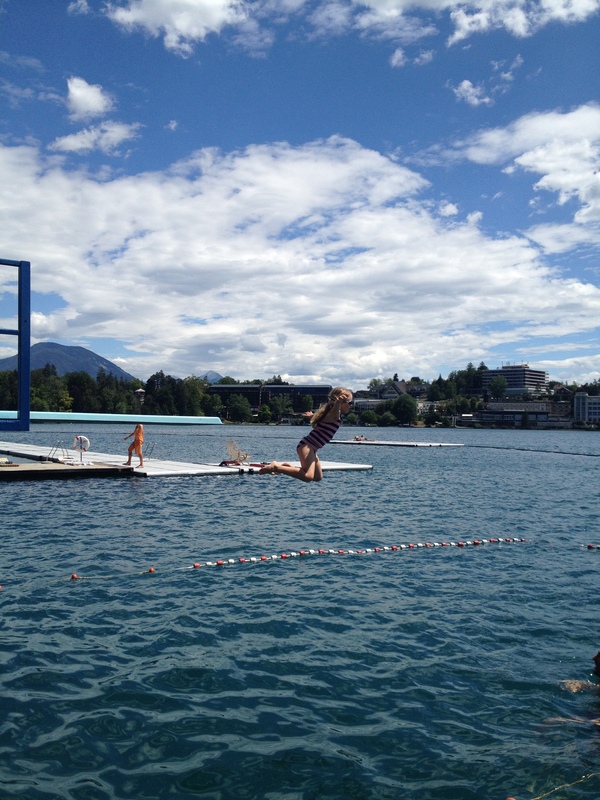 For me, lake swimming typically conjures up images of murky waters hiding unknown horrors, but Lake Bled’s waters were as pristine as any we’ve experienced.The water’s temperature, although a bit too bracing to slowly wade into, was perfectly refreshing when jumping off of the high dive at Grajsko kopališče (the Castle Bathing Area). 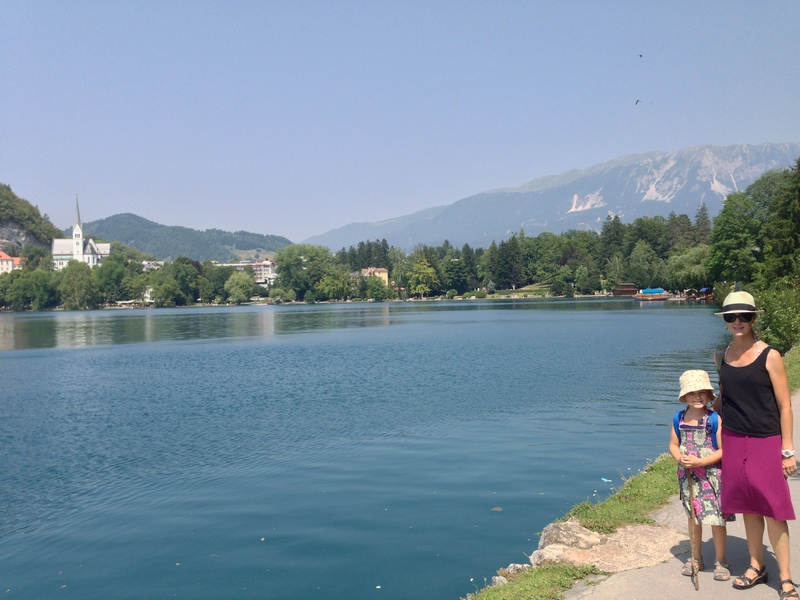 The lake has several designated swimming areas, but people line the banks along its entire circumference for picnics and swims and by the end of our week Zara had swum in all four quarters of the lake. 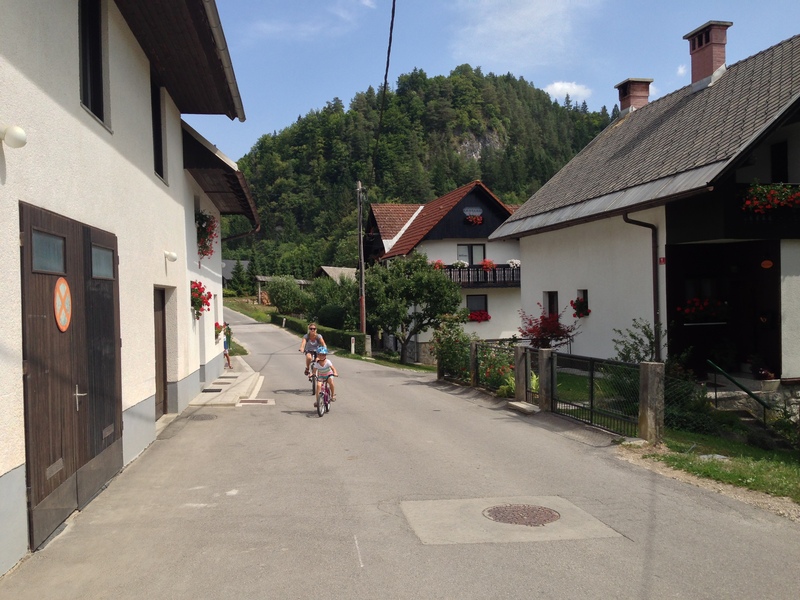 Another day we rented bikes and cycled through the surrounding countryside and its tiny hamlets in 90-degree heat. It was Zara’s first independent bike ride on roads with cars so I was a bit of a nervous nelly each time a car barreled by at 40 mph, but I did my best to remain calm. (I’m not sure that Zara would agree that I succeeded.) 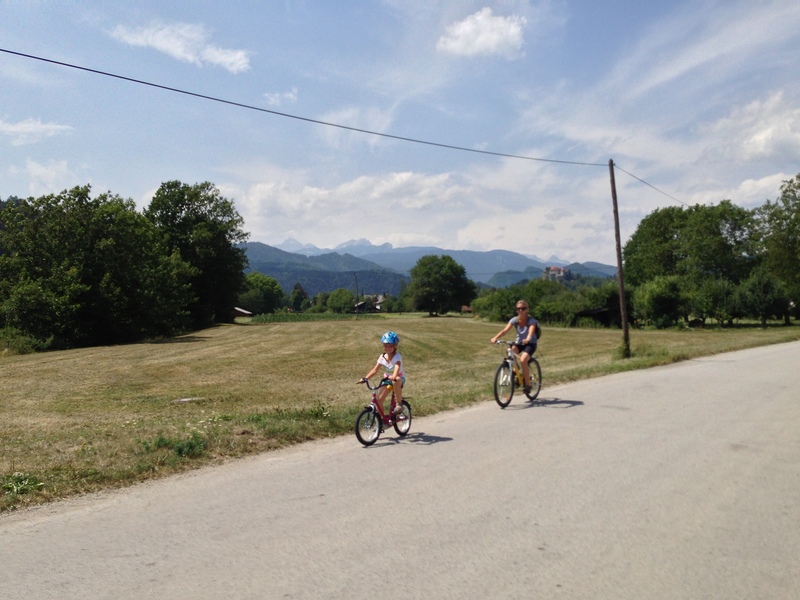 Once we reached the lake side, we cooled down with ice cream cones, cycled to the top of the lake where Z further cooled down with another swim and then raced against (and lost) a fast-moving thunderstorm for a very soggy but exciting ride back to our place. 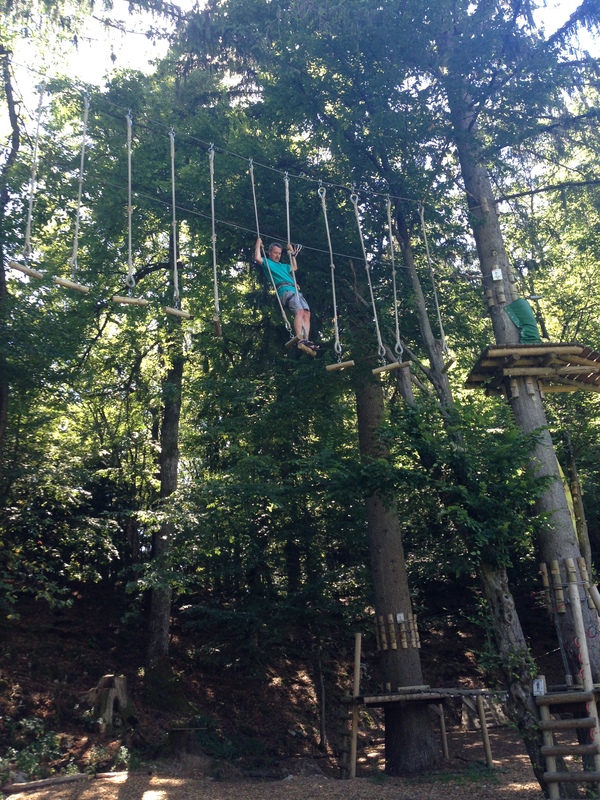 In keeping with the summer camp theme, we also summer tobogganed at the Straza and Z and J spent hours enjoying a ropes course at Pustolovski Park at the top of that same ski hill. Another day we took a 20 minute stroll up to Bled Castle, which is a cozy castle with panoramic views of the verdant hills and dramatic alps. 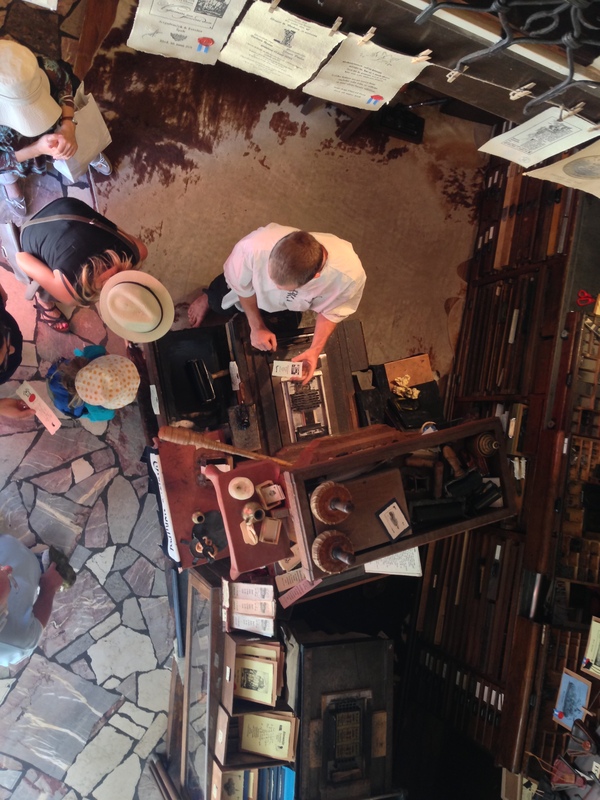 Although the castle is worth a visit for the views alone, it also has a printing shop with a reconstructed Gutenberg printing press, so we had an interesting demo from the apprentice printer on the printing method. We had hoped to dine in the restaurant there one evening as the setting can’t be beat, but we ran out of time. We stayed at the Apartment Gaja and were lucky enough to snag the apartment with a postcard view towards Bled Castle. In five minutes, we could walk to the lake or almost any restaurant in town. 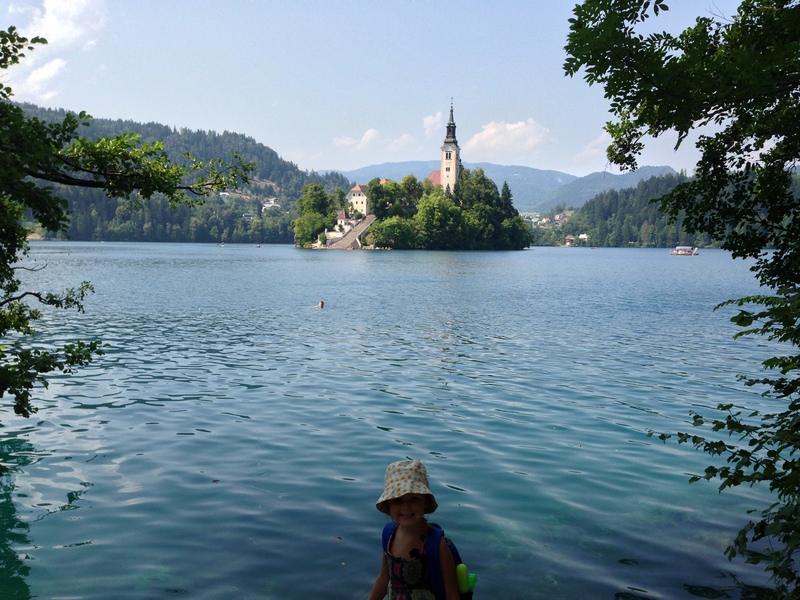 The Slovenians were incredibly friendly, English was widely-spoken, wifi worked well, the cuisine was not one-dimensional (we even found Indian and Mexican) and, perhaps most importantly, even in the peak of the summer tourist season, it didn’t feel unbearably crowded. (Oh, and I almost forgot, no mozzies!) If I lived in Europe, Bled, Slovenia would be a top choice for a summer cabin and I would happily return for a longer stay. 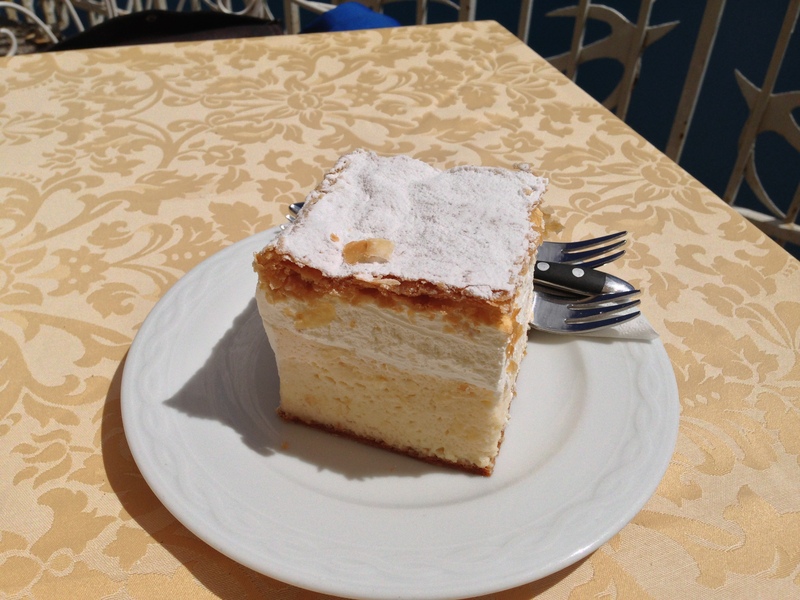 I was eager to explore more of Slovenia but my mom was flying into Vienna in two days so Austria beckoned…and, we were on the road again, but with moods a lot sunnier. 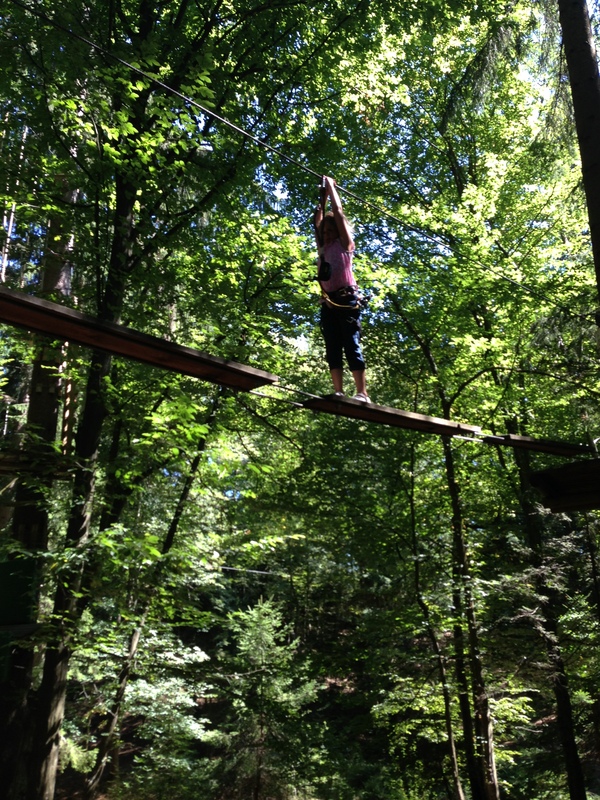 Ropes course at Pustolovski Park.